381 Room Pods and 57 Kitchen Pods at the new King Edward Quay development in Colchester will be supplied with sustainable hot water services, thanks to three 35kW AEROTOP® T air source heat pumps from ELCO UK. The new student accommodation is the first phase of a development by The Pickstock Group which is due to be completed in September 2014. 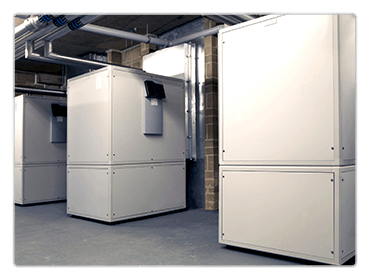 The three AEROTOP® T heat pumps have been installed alongside a 3,000-litre MAXIS glass lined cylinder, a PISCES pressurisation unit and a plate heat exchanger – also supplied by ELCO UK. The accommodation will offer students high quality rented accommodation with easy access to the nearby University of Essex. It will be rented out to both undergraduate and postgraduate students and, when both phases are complete, will comprise 779 rooms across eight floors. All Room Pods have been manufactured off-site by modular manufacturing specialists Elements Europe, who are part of The Pickstock Group, based in Oswestry, Shropshire. Their systems can be used in a number of construction sectors, and has the capability to achieve up to 23 storeys. All Room Pods are supplied with internals fully finished to the client’s specification. Room Pods are then delivered to site and installed by the professional installation team. AEROTOP® T heat pumps produce comfortable thermal heat with free energy from the ambient air. They can be installed both inside and outside buildings, providing specifiers and architects with a wide variety of siting options for new and existing buildings. MAXIS is a new range of highly versatile cylinders, which are suitable for traditional boiler systems, heat pumps and solar applications. The new cylinder is available in single and twin coil versions in capacities from 800 litres to 2,500 litres, as well as potable water buffer vessels in capacities from 800 litres to 3,000 litres.